I’m not a big fan of sunscreen. The biggest reason is because most brands made my skin feel sticky and almost as if it was not allowing me to sweat, and I would feel hot and constricted. So because of this, if I wasn’t planning on being in the sun too long, I would try to go without. And yes, I would burn. Over the past several years, I have adopted a clean, healthy diet, and have learned natural ways to help prevent sunburn. Good news for me since I can get away with a lot less sunscreen! I’m fair-skinned with strawberry-blonde hair and blue eyes—pretty much the exact type you would think gets burned 5 minutes after walking outside. And actually, I used to—but not anymore! It’s not because I’m living in a cave somewhere or slathering myself with SPF 70 all day long either. In fact, I now rarely use sunscreen! After doing some research and putting 2 and 2 together, I believe for me it has been because of two main factors. Good nutrition and supplementing with astaxanthin. I will also cover what types of sunscreens to use for extended sun exposure. 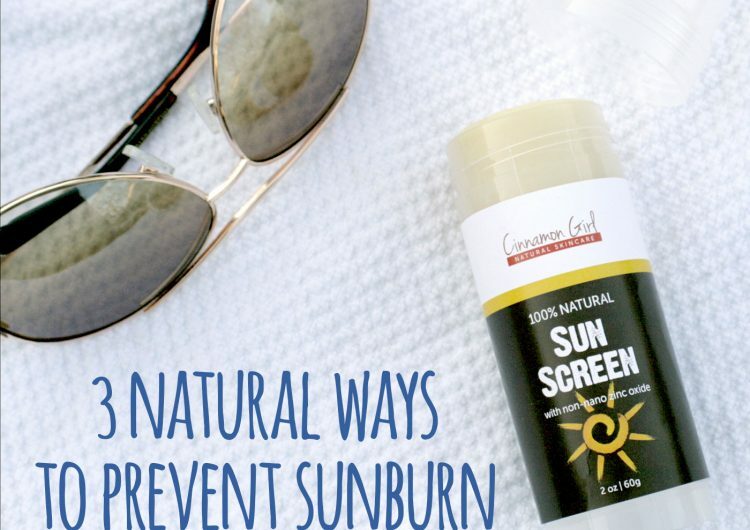 So here are three natutral ways to prevent sunburn. So long story short. About six years ago, my husband and I cleaned up our diet in a major way. We eliminated grains, legumes, sugar, processed seed oils, and processed foods in general. Life changing! My husband lost more than 50 pounds (easily) and I happily lost ten. Best part is that we felt great! With good, real-food nutrition I found that I don’t worry about my weight because it stays where it should, I have far less brain fog, my mood is amazing, my skin looks better, and a don’t get sunburned as easy. I have to admit I hadn’t expected that way my skin reacted to the sun would change! Healthy food can do amazing things! I first noticed this few years ago in Cancun. After a few hours in the sun, I realized that I had not reapplied my sunscreen. This was Cancun in April—my skin had not seen sunshine in over six months! Great. I thought that I was in trouble and would have a REALLY BAD burn—you know, the kind that stings when you take a shower or expose it to temps over 75. The kind that wrecks the rest of your sunny vacation. But no, the next day it was just a little pink and it didn’t hurt at all. Within a day and a half it didn’t even look like a burn at all. It was tan. What?!! This had never happened! This was great! I was happy my skin wasnt fried, but why? So I thought about it. Was the sun not as strong as I thought? Come on, this is Cancun—that wasn’t it. I’m from Wisconsin. I have pasty-white skin. No way. Needed a better answer. I started thinking about what was different at this time compared to the past. Super great long lasting sunscreen? Nope, I was using the same stuff I had used for the previous few years. The only thing that was different was the major change in my diet. That was it! It makes sense. Sunburn is inflammation. The inflammatory response is even greater when we have chronic inflammation going on internally. While I have no official diagnosis or obvious symptoms of chronic inflammation, I ate a standard American diet of processed crap for most of my adult life, so I’m pretty sure that I had some level of inflammation going on. This new found side effect from a real food/paleo diet makes a lot of sense. It further goes to show you how food and nutrition affect EVERYTHING in our bodies! First, let’s talk about nutrition. Personally, I pretty much follow a Paleo/real food diet (about 90%). I eat lots of veggies, grass-fed/pastured meat and eggs, pretty much nothing that comes in a box, and very little dairy or grains (occasional corn tortillas or rice). I’ve mostly eliminated foods that cause chronic inflammation and replaced them with more nutrient-dense real food. I think that removing processed seed oils and sugar has made the biggest difference for me in terms of reducing inflammation and reducing my tendency to get sunburned. Eliminating processed seed oils like canola, corn, soybean, and cottonseed oils is important for reducing inflammation. These highly processed (and often rancid) oils are mostly polyunsaturated, and are very high in omega 6 fatty-acids which can encourage inflammation when consumed in large amounts. Increasing intake of Omega3 fatty acids also helps reduce inflammation in the body. Omega3s are found in fatty fish like salmon, tuna, and sardines, as well as grass fed meats. I have really noticed a difference since swiching to healthy, saturated and monounsaturated fats like butter, ghee, lard, coconut, and avocado oil. These fats also contain vitamins A, D, E, and K which may also contribute to overall skin health. I also think removing most sugars from my diet helped as well. Sugars, and refined carbohydrate foods like bread and pasta cause a blood sugar roller coaster in your body which also leads to chronic inflammation. I found that limiting my sugar intake to occasional fruit and a little bit of honey or maple syrup has made a huge difference in my overall health. In addition to not burning as easy, I have fewer jeadaches, and fewer general aches and pains. I also have more energy and my moods are much better. Decreasing sugar intake is one of the best things you can do for your body in general to reduce and prevent chronic inflammation. Reducing inflammation has made a huge impact in the way my skin reacts to the sun. It makes sense to me now that what I eat has a direct effect on every aspect of my health including my skin. I feel better than ever, and I also love these cool, unexpected side effects like reduced sunburn! My skin is generally healthier and therefore it is better prepared to handle some sun exposure. It’s kind of a cycle: good nutrition allows me to stay in the sun longer and get more vitamin D which adds to my good nutrition that allows me to stay in the sun… pretty cool, right? The second thing that has added even MORE sun protection to my skin has been supplementing with astaxanthin. According to Nutrex Hawaii, a quality manufacturer of natural supplements, Astaxanthin is a naturally-occuring carotenoid pigment that is found in algae, selfish, and salmon. It is a powerful anti-oxidant. It is beneficial for faster muscle recovery after exercise; joint, tendon, and muscle health; eye and brain health; and skin protection during UV and sun exposure. I take astaxanthin starting in the spring to prepare my skin for summer sun, as well as a month or so before a sunny vacation. I have learned that it takes about 30 days to see the benefit of astaxanthin. After a few weeks of taking it, I notice a healthy, light pinkish glow to my skin. Pinkish in a good way, not red or flushed-looking in the slightest! Astaxanthin really does work as an internal sunscreen. Even though my skin had an improved resistance to burning just from a nutritious diet, adding astaxanthin made a BIG difference as well. It is one of the few supplements that makes a noticeable difference for me. It is literally sunscreen that you eat! I would estimate that I can stay in the sun at least twice as long without burning as I could before! Now, I actually get a light tan over the course of the summer, which is the skin’s built-in way of regulating the effects of sun exposure. This was not always my case, as an adult anyway. Probably since high school, my skin would look as pale at the end of summer as in the beginning—partly from using high SPF sunscreen, partly because I would burn and then lose the color! As a small child, I don’t remember using sunscreen very often (products higher than SPF 15 didn’t even exist in the 70s & 80s), and I was outside all of the time! We also ate mostly real homemade food and junk food was around, but limited. Go figure. Once again, a correlation of nutrition affecting skin health and susceptibility to burning! 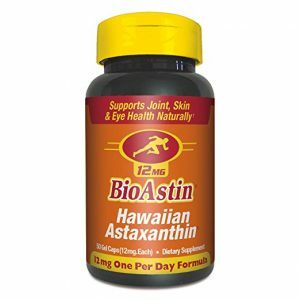 I love the internal protection I get from taking Astaxanthin. I personally like Nutrex Hawaii BioAstin. I take 8-12mg each day starting about a month before summer sun, which is the recommended dose. I also start taking it 3 to 4 weeks prior to a sunny vacation! Astaxanthin certainly adds a level of natural sun protection, but when I am on vacation or exposed to the sun for extended periods of time, I most certainly use sunscreen! We want some sun for getting them most bioavailable form of vitamin D, but we don’t want to burn! Of course I realize that overexposure can be harmful! I don’t TRY to get burned, and would NEVER recommend it! I use and recommend natural, mineral-based sunscreens, which provide a physical barrier between the sun and your skin, when I know I will be in the sun for more than an hour. That way I get the benefits of the sun without the burn. I avoid chemical sunscreens because I don’t want the chemicals getting absorbed through my skin. Some of the ingredients in sunscreens end up doing just as much harm as good (many are carcinogenic). They do protect from the burning UVB rays, but they usually don’t protect against the damaging UVA rays! I personally prefer one with zinc oxide because the zinc physically blocks both UVA and UVB rays providing complete protection. I also cover up with clothing and/or a hat when I’ve had enough. Some sun exposure is great, but you can get too much of a good thing! Try to find some shade, put on a hat, and cover your skin! When that’s not possible, or you will be in the sun for longer than you want, use a natural, mineral-based sunscreen. Look for ones made with zinc oxide. Carrot seed oil and raspberry seed oil are also natural sunscreens. These two oils are very expensive, so it is not likely to find them in large amounts in most sunscreen products. A few sunscreens I like are ThinkSport SPF 50 Sunscreen, ThinkSport SPF 50 Kids Sunscreen, and Badger Balm Zinc Oxide Sunscreen SPF 30. I have one available on my Etsy shop with an equivalent SPF of about 20. 3. Use a natural, mineral based sunscreen for extended sun exposure to protect from both UVA and UVB rays, and of course find some shade!